More than 3 million years ago the desert near present day Atar was hit by some 20 m large meteorite and Aouelloul crater formed. Today this is one of the best preserved impact craters on Earth. Local people knew about the existance of this unusual place since ancient times. In the rims of crater are several ancient tombs. Locals call this place – "hofrath A’welloul" ("Hofrat Aouelloul" – Aouelloul Hole). First European to see this crater was A. Pourquié, who saw it from an airplane in 1938 while making aerial photographic mapping of this area. Théodore Andre Monod (Natural History Museum of Paris) reached the site on foot in 1950 and both published account of their discovery in 1951 (1.). Crater has well defined rims, which rise 15 – 20 m high above the surrounding plains. Diameter of crater is approximately 390 m – this is comparatively small impact crater. Bottom of the crater is up to 53 m below the rims. Sometimes small, perennial pool of water forms in it – this means that meteorite has not cracked the bedrock. Meteorite here met Ordovician sandstone and quartzite rock. Porous mass of sandstone softened the impact, but nevertheless the consequences were significant. Explosion raised thousands of tons of sandstone and quartzite rock, some of it melted. Now the rim of crater is formed from coarse rock thrown up from the crater, part of sand is vitrified by the extreme heat. The bottom of crater is covered with thick layer of aeolic sand and silt. There have been no explorations but it is assessed that thickness of this layer is approximately 23 m – thus the depth of crater is up to 56 m without counting the rim or roughly 76 m, if the height of rim is added. Only one piece of meteorite has been found near the crater and it is even not clear whether this piece is from the same meteorite which formed the crater. This stone – Zerga meteorite – was found in 1973. To the south, south-east and north from the crater though are found unsighty, semi-transparent, brown stones – tectites. Tectite is natural glass, formed by the heat and scattered by the impact. Tectites provided valuable information about Aouelloul meteorite. Analysis of their chemical composition shows that content of osmium, iridium and nickel in this glass exceeds the content of these elements in surrounding rocks. Thus it was proved that Aouelloul crater is an impact crater. Analysis provided also data about the age of meteorite – it is 3.1 ± 0.3 million years, Pliocene period. This meteorite most likely was chondrite, e.g. it was stone meteorite, albeit with rather high content of iron. It is hard to tell the direction of the impact, but a bit to the north is found another, smaller crater, possibly formed by a smaller piece of this same meteorite. 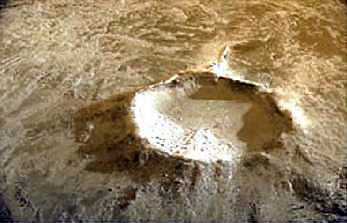 This impact crater shows that the main impact was in the centre, e.g. meteorite struck from above. Very rough calculations show that, if the meteorite approached Earth with a speed of 20 – 25 km per second, this meteorite had a diameter of some 20 m.
Sometimes (elsewhere) tectites are beautiful gemstones, but main value of tectites is their rarity, these are valuable items for collectors. The desert near Adrar is almost lifeless and the red hue of sand makes it similar to Mars. Heat here for most time is almost unbearable and Europeans, who search for tectites, soon conclude that the outcome is not worth the effort. Most tectites are found by boys – shepherds, who sell them to merchants. These stones rarely exceed the size of fist. In local markets though most tectites are falsifications. The few tourists coming to this area often are buying just a slag from old iron smelters and even stones processed by people in Neolithic Age. Crater is privately owned, visitors are asked to leave cars outside the crater and not to make tents inside it. Th. Monod, A. Pourquié. Le crateré d’Aouelloul (Adrar, Sahara occidental). Bulletin de l’Institut fondamental d’Afrique noire, 1951, 13, p.293 – 311. Accessed on December 26, 2012. Cosmic Secrets. 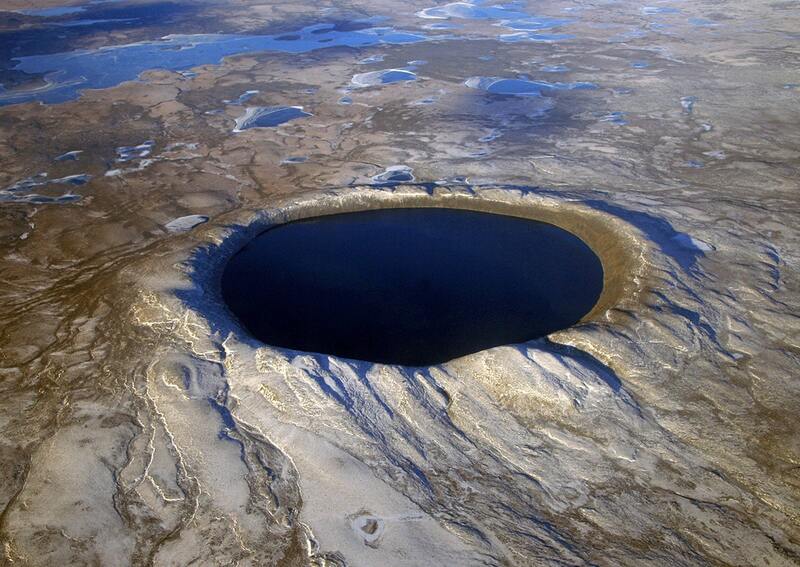 The Enigmas on Earth – Impact Craters on Earth. Accessed on December 26, 2012. Christian Koeberl, Wolf Uwe Reimold, Steven B. Shirey. The Aouelloul crater, Mauritania: On the problem of confirming the impact origin of a small crater. Meteoritics & Planetary Science 33, 513-517 (1998). Accessed on December 26, 2012. 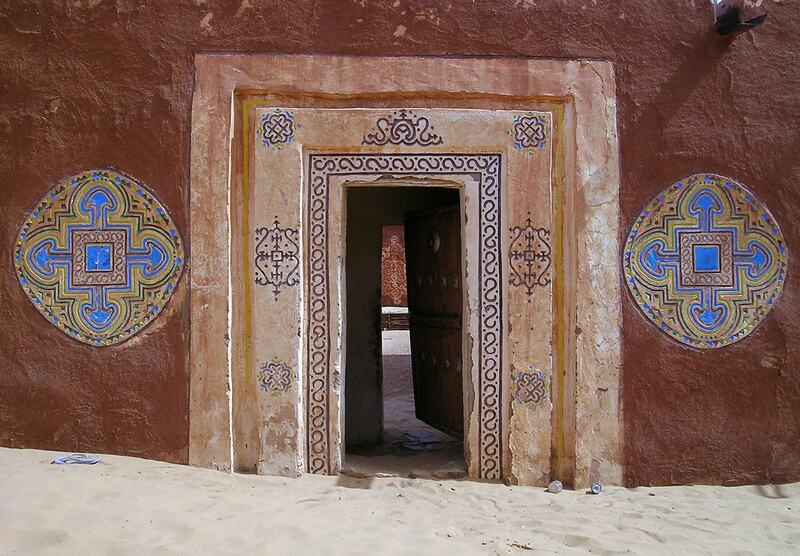 Almost all of Mauritania today is desert – somewhere desolate, somewhere – with some plants, lakes and animals. In earlier times the nature here was less harsh, great cultures developed. People from those times have left countless cliff paintings and etchings, megaliths and abandoned towns. Nature of Mauritania also provides surprises – giant, smooth and very dark granite monoliths, rising hundreds of meters above the desert, and even wealth of life – millions of birds at the ocean and even unusual dwarf crocodiles in the desert plateau of Tagant. There are many pieces of solid matter flying around in the space. And VERY frequently they fall on the surface of Earth. There are estimates that every year on Earth fall 18,000 – 84,000 meteorites larger than 10 grams: e.g. one meteorite every 6 – 30 minutes. This category includes outstanding impact craters – detectable scars on the surface of Earth left by a body coming from outer space. Category includes also meteorites – natural objects from the outer space. 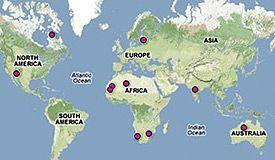 Africa is home to more than the Cradle of Humankind. It was the core of the ancient supercontinent Pangaea, and comprises some of the oldest and most extraordinary geology on planet Earth. This detailed and colourful book features 44 of the continent’s most spectacular and interesting ‘geosites’, from Table Mountain in the south to the eroded necks and plugs of the Hoggar region in Algeria. When Peter Hudson set off for Mauritania, he knew it only as a big blank space on a map of Africa. Travelling from the capital, Nouakchott, hardly more than a desert encampment, he found among the oases and ancient caravan towns a people in harmony with their harsh surroundings.